Bhetki is my favourite fish among all. In US, I am yet to track down a shop that sells my favourite fish. Even the Bangladeshi grocery store the very sight of which brings smile on my face does not have Bhetki in their inventory. Sigh!! But after coming here I have fallen in love with Salmon fish. In India, I have cooked Salmon on various occasions but amidst abundant produce of Bhetkis , Salmon always got to the backseat. 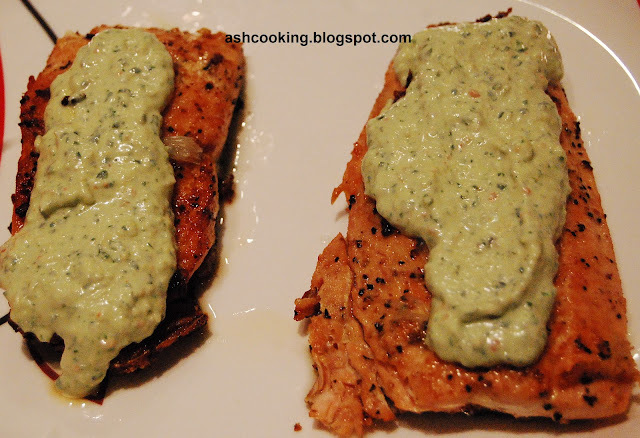 The below recipe can be cooked with any fish with fewer bones like Tilapia, Bhetki and Salmon. It is one of the best pestos I have tasted and together with Salmon it makes a top notch combination. 1) Rub salt and lemon pepper on Salmon fillets. Keep aside for half an hour. 2) Heat oil or butter or both combined in a non-stick skillet. Add the minced garlic and bring them to a golden brown color. Place the Salmon fillets on the bed of browned garlic and fry on medium heat till Salmon is cooked both inside out. 3) Squeeze lime juice on top of the fillets when they are done with frying. 4) In a blender, grind the ingredients for pesto to a fine paste of smooth consistency. 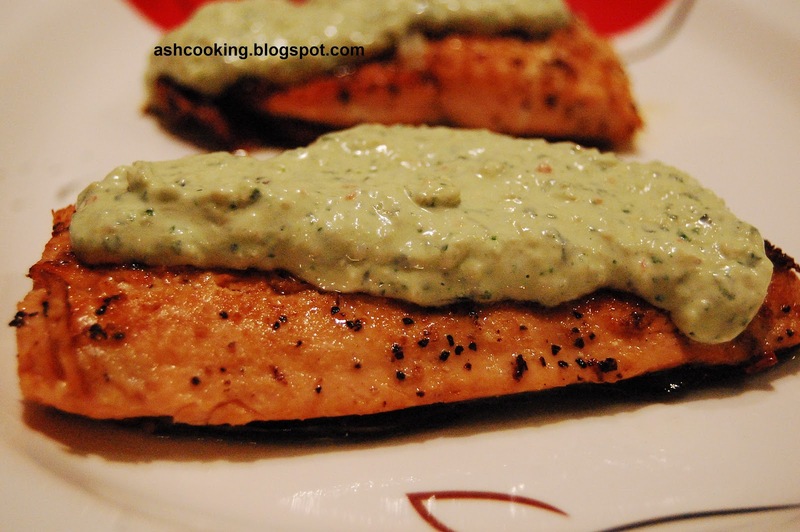 5) Serve the Salmon fillets topped with spoonful of pesto.